Want to see what JOYFUL looks like? 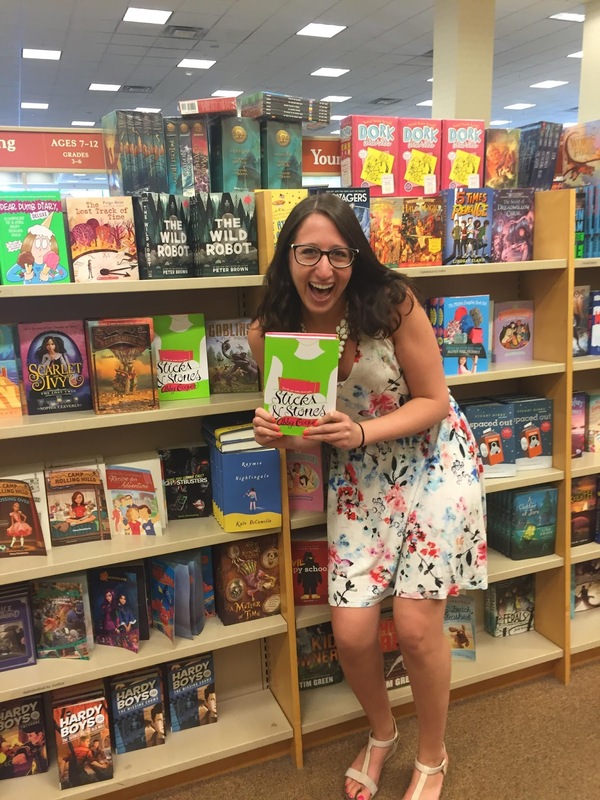 Here is a picture of our very own Abby Cooper taken just after she saw her middle grade debut Sticks & Stones on a bookshelf for the first time. In Sticks & Stones, the main character Elyse has a rare condition that causes the words others call her to appear on her arms and legs. Since she was a baby, most of the words have been pleasant. But Elyse is in middle school now and the words are not always kind. Sticks & Stones is an INSPIRING story about the way words shape us and our understanding of our place in the world. Jen Malone: This book shows that words have power, and none more so than the words we tell ourselves. Brooks Benjamin: Abby's book does such a good job showing that everyone deals with hurtful words and than when that happens, there are people out there who can lift you up with the right ones. Ronni Arno: Words convey feelings and thoughts that can change lives. It's important that we remember that and use our words wisely. Chris Brandon Whitaker: I love stories that embrace our differences, whether they be about social, mental, or health matters. Gail Nall: Goshdarnit, there are some really funny moments in this book! Stefanie Wass: I could not stop reading this book! Ella Schwartz: This book is truly such an original concept. A premise unlike anything I've read recently. Melanie Conklin: Kids really need to hear that they don't need to be so hard on themselves. Elyse's story will inspire them to have empathy for themselves. Laurie Litwin: I read this book in a sitting. Jo Marie Bankston: We need stories like Sticks & Stones to remind us that words are powerful. They can inflict intense pain. Or they can help a person grow, learn, and love. Becky Appleby: You can't help but to fall in love with Elyse and root for her to fully accept herself. Rhonda Battenfelder: Elyse's strength and bravery are inspiring. As Abby celebrates her book launch, I hope that she feels all of our warm words surrounding her.